One of my favorite (and easy!) 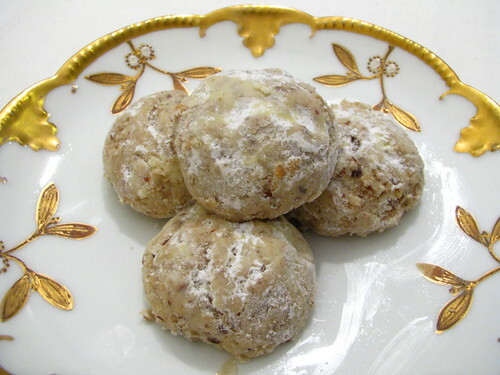 cookie recipes is Russian tea cookies, also known as Russian tea cakes. They are light, buttery and full of nutty goodness. Did I mention they're easy to make? Stash that in your holiday menu planner! In a large bowl cream the butter, a 1/2 cup of powdered sugar, water and vanilla; mix well. Stir in flour, salt, and pecans until dough holds together. Cover and refrigerate for one hour. After the dough has chilled, preheat oven to 400°F. Shape dough into 1-inch balls and place 1-inch apart on an ungreased baking sheet. Bake 18 to 20 minutes or until slightly brown. Let cool. Roll cookies in remaining powdered sugar to evenly coat. These sound fantastic! I usually shy away from sugar and butter cookies because I like a big, thick cookie (typical of most chocolate chip, oatmeal raisin, etc). But these look like they're moist, fat and delish! I grew up in Moscow: your post brings back good memories! My boyfriend's mother makes these and they're the best cookies I've ever had. And now you're telling me they're easy and easy to veganize? A big thank you, I'm bookmarking this recipe for sure! I am just wondering if the two flours listed in the ingredients should be all put in, int he beginning? Is there a reason why they are listed sepeately? I would love to make these as they look so impressive. I AM RUSSIAN, I HAVE NEVER HEARD ABOUT SUCH COOKIES!!!???? This was a favorite cookie of mine that my (ex) mother-in-law used to make for the holidays. Now that I am no longer part of the family- I've missed these cookies. THANKS for the recipe.